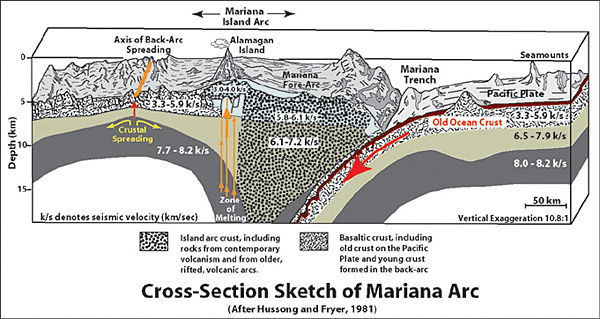 This 3-D sketch shows a cross-section of the Mariana Arc with some of its main structures and features. The numbers represent the speed of sound in the various layers beneath the arc measured by the precise timing arrivals from earthquakes and man-made sources. Higher velocities represent more dense material. Note that there is old ocean crust descending in the trench at the same time new crust is forming along the island arc (from deep melting of the down going plate) and in the back-arc spreading center (from extension behind the arc). Modified from Plate 2 of Fryer and Hussong (Proceedings of the Deep Sea Drilling Project, Leg 60, pp. 45-55, 1981).